Expense reports–so important for travel and expense managers, yet often an annoyance for employees. Tracking down receipts and categorizing spend may be tedious and time-consuming for employees, but they’re an indispensable tool for tracking T&E spend, mitigating overspend, and future budgeting. Just because expense reports can be boring doesn’t mean that they need to be a complicated burden. After all, part of your job as a manager of travel and expense strategy is to steer strategy. A little change to the expense reporting process goes a long way to ensuring a frictionless, stress-free, and time-saving experience for employees, and cuts a few tasks off your own busy to-do list as well. With those goals in mind, we’ve identified 13 things you can work on that will help create that frictionless experience for your employees, and for your own department. A smoother expense reporting process can ease your travelers’ minds before, during, and after their trips. Here, we follow the traveler journey and identify common pain points in the T&E process. If you’re already partnered with a Travel and Expense Management vendor, chances are you’ll already have access to a mobile app for expense tracking. But if not, don’t worry. There are a number of free and paid apps which can help employees track spending on the go. This cuts down the amount of time spent on expense reports when they return from traveling. Many companies are moving to cloud-based expense report programs, and for good reason: they skip over the dreaded spreadsheet that employees hate handling. This tremendous employee benefit helps the back office as well — instead of toggling between multiple spreadsheets, managers can view and organize all expenditures in one convenient platform. If you can eliminate the spreadsheet, it’s likely you can then start to tackle that mountain of receipts. Allow employees to use their phone camera to snap a photo of each receipt and attach, then throw the paper away. You get the information you need, they toss the extra paper out of their wallets. Give employees the option of using the same apps for work that they do on their personal time, ordering rides and food with a tap or two on their screens. Instead of having employees log and expense trips separately, or create separate accounts, suggest employees create a separate business profile within their accounts. For example, with Uber, employees can set up a business profile with a separate payment method from their personal Uber rides, and receipts automatically forwarded to their company email address. Open up easy lines of communication so employees don’t need to second-guess spending limits or permitted expenses. A quick email option allows employees to send over their questions as they arise. For an even quicker response, introduce a chatbot or a text-based system so employees can get clarity in an instant. Many apps introduce a suite of business-friendly tools which allow for a smoother expense tracking process. 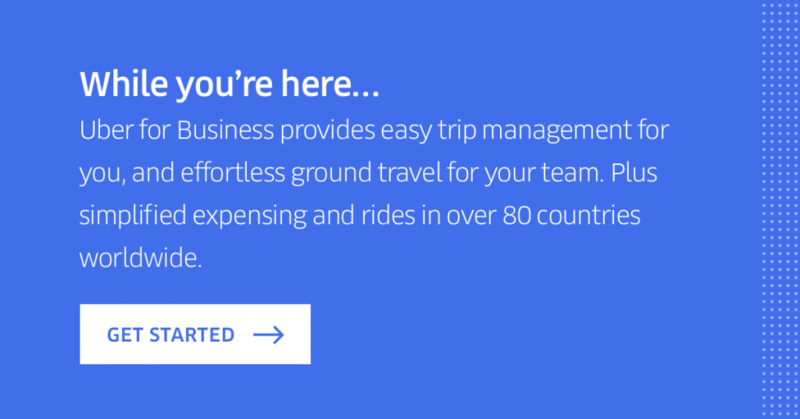 For example, a company using Uber for Business can either forward receipts automatically to an expense provider, or eliminate ride receipts all together, with employee travel tracked centrally in one single dashboard. These expenses can also be limited by dollar amount, expense code, time of day, location, or vehicle type. The result? Your employees can skip the receipt altogether! Assemble the most frequently asked questions about your expense reports, such as types of eligible expenses and expense limits, into one handy sheet. Be sure to include items that are often omitted or reported incorrectly on monthly expense reports. 8. Make sure your FAQ can be found! Your FAQ is no good if your employees can’t access it whenever and wherever they need it. Create a digital version on your company intranet or wiki that’s easily accessible. You could even print wallet-sized laminated cards so employees can check if common traveling spend items, such as tips or rides, are considered eligible expenses. Do spending limits fluctuate based on location, occasion, or time of the year? Do your employees even know the spending limit? Employees may find they unintentionally overspent simply because they traveled to a more expensive area or thought the spending limit was higher. Adjusting spend limits based on location and occasion, and making those limits crystal-clear, will help alleviate the burden when the final trip bill is tallied upon return to the office. Give employees a weekly time slot during which they can come to you with any travel questions they might have. If you’ve got a more distributed team, consider offering timeslots throughout the day where any employee feels comfortable discussing concerns with your department. The best way to craft an easy-to-navigate expense report process is to solicit feedback from the end user–the employees. Send out a survey once someone returns from a trip or work event. Ask questions on the ease of tracking expenses, the reality of the spending limit, and how easy or difficult they found the expense report process. Feedback collection shouldn’t stop there: consider hosting monthly lunches to gather input from employees. More important than collecting feedback is implementing changes based on what you learned. If most employees loathe a certain element of the expense report process, use their feedback to develop ways to improve it. Remember, the expense report process isn’t going anywhere — your job, then, is to ensure it moves as smoothly as possible. Organized rollouts and announcements bring visibility to T&E, a department often overlooked until it’s time for employees to submit receipts. Plus, a loud and clear announcement further demonstrates the importance of your changes: employees know you heard their ideas, while upper management knows you’re working tirelessly to closely watch their bank accounts. As the person in charge of business travel and expensing, you know how valuable accurate expense reports can be. That’s why it’s so useful to aggressively, and relentlessly, pursue simplicity as a master strategy. A handful of clear steps, cutting the clutter from a multi-faceted process, and bringing a bit of innovation to the process can go a long way in crafting a stress-free system. You may not get employees to love expense reports, but you’ll certainly make their lives–and your job–easier!